View Timeline Showing Daniel Bassill involvement since 1973. *	Volunteer Director of the Montgomery Ward-Cabrini Green Tutoring Program from 1975-1990. Program grew from 100 to 300 pairs of teens and volunteers over 15 years. In addition, I helped grow the Lawyers Lend A Hand to Youth Program at the Chicago Bar Association (http://www.lawyerslendahand.org/) from a $2k award in 1994 to a $2 million foundation in 2007, as 1)non-profit partner and founding member of Executive Committee of the Lend A Hand Program from 1994 to 2001 while it operated as part of the Chicago Bar Foundation; 2) member of the Executive Board of SunTimes Marovitz Lawyers Lend A Hand to Youth Program from its founding in 2001 through 2008. 36 years leading a volunteer-based tutor/mentor program, connecting workplace volunteers and inner city kids. Visit this page to see a list of awards and recognition that has been earned in the past 30 years. Can you help fund this work? Click here and learn more. Bassill began using computers to solve problems and do work of many people when with the Montgomery Ward Corporation in early 1980. 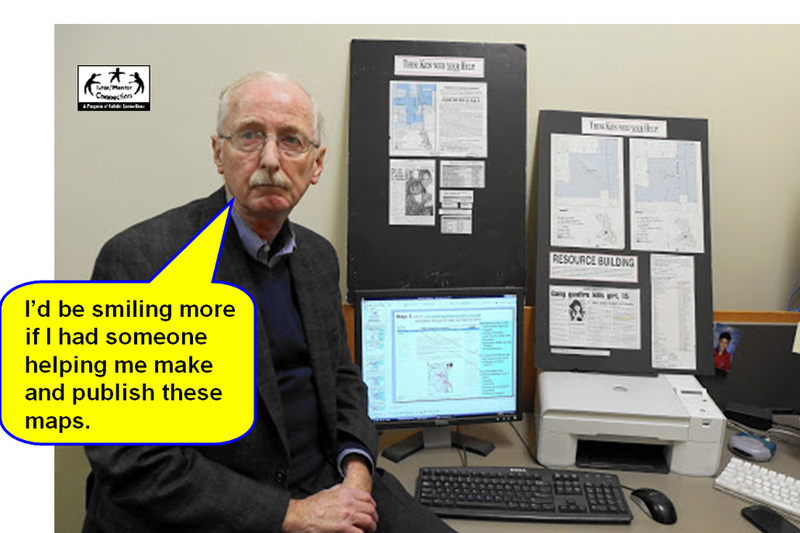 In 1997 he began integrating the Internet into the strategies of the Tutor/Mentor Connection and Cabrini Connections. On this Tutor/Mentor Institute web site are many pdf essays written by Bassill to illustrate his views and strategies, along with links to many places where Bassill shares extensive information about tutor/mentor programs, where they are needed, why they are needed and how business, philanthropy and volunteers can be more strategically involved. Bassill shares his ideas on this and other web sites, writes the articles on the http://tutormentor.blogspot.com and http://mappingforjustice.blogspot.com blogs and contributes comments and articles at many other places where he shares ideas and network with others. His goal is to help a generation of new leaders learn from his own experiences, so there are thousands of people working in the same way to build mentor-rich volunteer-based programs that aim to transform the life of youth and the volunteers who become part of these programs. In April 2011 the Board of Directors of the combined Cabrini Connections, Tutor/Mentor Connection voted to no longer support the T/MC strategy after June 30. Read more. In July 2011 Bassill created the Tutor/Mentor Institute LLC to provide a new structure to generate revenue and partnership to support the continued operation of the Tutor/Mentor Connection in Chicago and similar intermediary organizations in other cities. This new structure depends on continued aid from those who have supported the work done over the past 18 years along with finding new partners, sponsors and benefactors. Review of past 25 years. Visit this HISTORY page. See Videos showing T/MC strategy. See visualizations by interns, explaining T/MC and Tutor/Mentor Institute, LLC strategies. Many people complement the broad based thinking Dan brings to this effort. He's an "artist" . In this article, one person says he deserves a Genius Award. Can you become his benefactor and help make the ideas shared on these web sites more of a reality? E-mail Bassill at "tutormentor2 at earthlink.net ". Connect on Twitter@tutormentorteam or join the Tutor/Mentor Institute on Facebook.